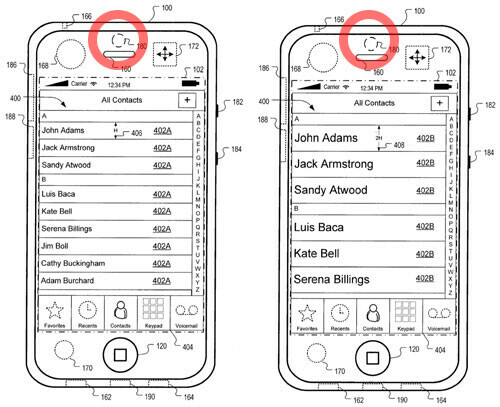 Gizmodo is reporting that Apple is trying to patent a UI that changes with the environment that the user is in. For example, an iPhone owner is sitting in the back seat of a car (never drive while talking on your cellphone), trying to press a name on his contact list, but the car is bouncing around on the road making the task difficult. Based on the idea in the patent, the iPhone screen would change with the names on the list growing in size to make it easier to touch the right one while the car is unstable. The drawing of the device on the patent form shows a front facing video camera as part of the equipment required for the UI to morph. The camera could also be used for real time face to face video chat. Video calls have been a normal part of the cellphone experience overseas for some time now, but has not yet been supported by U.S. carriers and phone manufacturers. The only thing I have to say is... http://www.engadgetmobile.com/2009/04/16/verizon-chief-talks-lte-iphones-hates-on-rival-i-dont-know -w/ "Seidenberg also said that he believes Apple will be more willing to work with Verizon in the future on an LTE-equipped version of the iPhone" -www.phonescoop.com ...VZW LTE iPhone FTW. That would make the iPhone really cool. The only thing that make that feature uncool would be the price that you may need to pay to use it. I also don't see myself talking to my phone. It may be a novelty that last one week, but afterward it may get kind of boring. You have to be static to be using that ***walks using iChat mobile*** ***thumps on pole*** A cool use would be for business like press conferences and all those goodies, even for school. You are sick at home or cant get to class, you iBuddy streams the live class for you - that sounds cool. EXACTLY. All those VZW fanboys will be flipping their hatred for the iPhone as soon as it hits Verizon. Then all the bitching they've done will have meant nothing. Idiot fanboys.